Is there a G.I. Joe fan out there who doesn't love Snake Eyes? The ninja side of the Greatest American Heroes toy line and cartoon was always the most popular, perhaps because their skills set them so far apart. 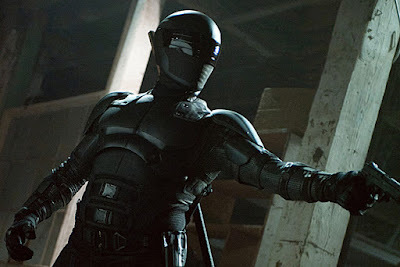 Even the first two live-action films focused heavily on the rivalry between Snake Eyes and his sworn enemy, Storm Shadow. And now we're going to see that fight continue in a spinoff. Paramount has hired Beauty and the Beast and Bright 2 writer Evan Spiliotopoulos to begin work on a Snake Eyes solo movie script. He'll be in charge of writing the adventures of the Joes' most popular member with the distinct look. The silent ninja is part of the Arashikage ninja clan along with Storm Shadow, and wears a full black body suit and mask to hide his disfigured face. In the comics and cartoon he had a romantic relationship with Scarlett, and had a number of apprentices who would join the G.I. Joe team.